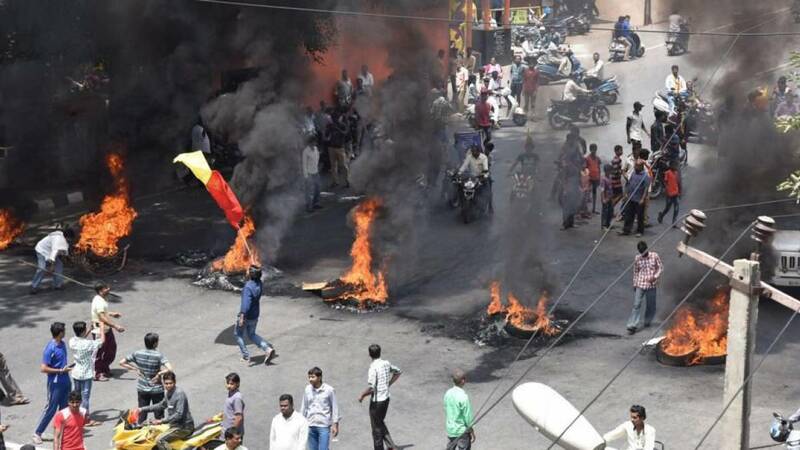 New Delhi : One person was killed in police firing in Bengaluru after the angry mobs continued torching scores of vehicles till late Monday evening. Curfew has been imposed in sensitive localities. The protests broke out by Kannada activists after the Supreme Court ordered to release Cauvery water to the neighbouring state. While the Karnataka government announced Rs 10 lakh compensation to the youth who was killed in police firing on Monday night at Hegganahalli. The Karnataka Home Minister requested people of Karnataka to maintain peace in the state and not to take law in their hands. Earlier Union minister Venkaiah Naidu also appealed for calm in Karnataka. # Colleges, schools, government and private offices and banks have holiday for Eid, while IT firms were asked to work from homes in view of the boiling tension in the. # Whiles shops, markets, malls, hotels, eateries are forced to observe shutdown. # Public transport including buses, taxis and auto-rickshaws have been asked to stay off the roads, while metro rail service has been suspended. # 25-year-old Umesh, died when police fired to disperse a mob attempting to torch a patrolling vehicle. # Curfew have been imposed for three days from Tuesday in the Bengaluru’s north-west, south-west, north east and central areas to maintain peace and prevent untoward incidents.